As Rick had mentioned in his previous post, we’ve been kept busy (best described as being in a constant state of mouths-hanging-open) by Parker Jane’s experience of constantly growing, learning, and understanding. But it has been far too long, and far too much has happened in her little world, so it’s time for an end-of-year-in-review. Accompanying this post is a gigantic flickr update with tons of old & new photos. Parker Jane’s “worm” scoot evolved into a full fledged crawl early in the month. And she was off! She is particularly fast when one of us opens the refrigerator door – she likes the bright light and the cold surfaces. We try to be energy efficient in our household, though, so keeping the fridge door open for her just won’t work out. 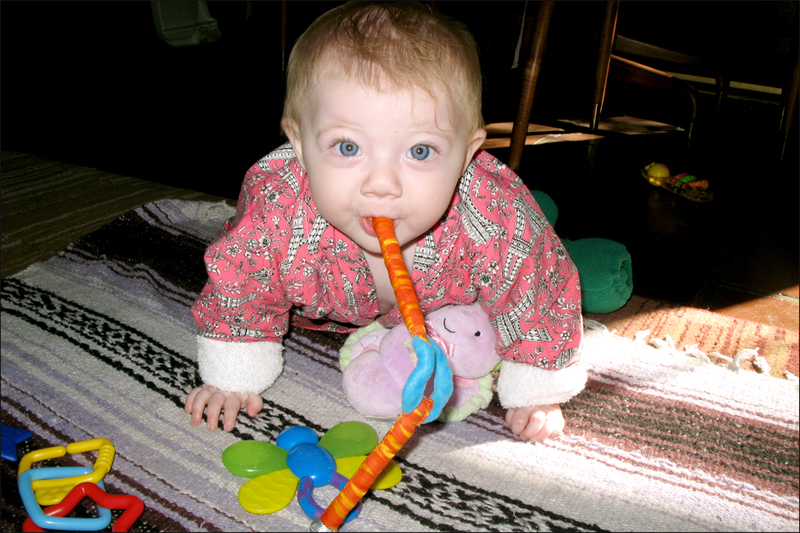 Once she mastered crawling, she got fast to work at pulling herself up to standing. This is a challenging stage, not because of all the little bumps and bonks, but knowing that she needs to experience the bumps and bonks in order to learn and improve. She’s also at the age where she looks to make sure you’re watching before she starts wailing. Later in the month we spent time with both sets of grandparents for early Halloween celebrations. We went with my parents to “Bates Nut Farm” with hundreds of other people who only wanted to pick out a pumpkin and take a picture, but found themselves among a huge fall festival. Next year this extravaganza will be more worthwhile, but for an 8 month old who’s in need of a nap, it was much more than we bargained for. Luckily, we were able to find parking, see the farm animals, take the pumpkin pictures, and get out in a half an hour. Then we visited San Jose for a quick weekend and sought out a pumpkin patch nearby. Parker Jane impressed her great-grandma at her first piano lesson and had lots of fun banging on the keys. She had some good one-on-one time with Grammy and showed her how much she has changed in only two months. 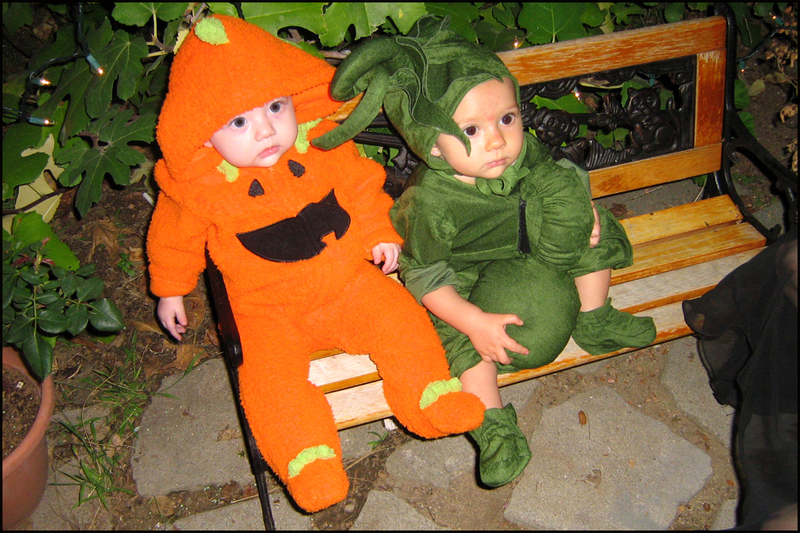 A Halloween first: Parker Jane as “pumpkin”, and Shara as “pea pod”. Eight months old, and they flawlessly stay in character. Kids these days, huh? The day of the surgery came and went (see previous post), and afterwards our life and home quickly adjusted to Parker Jane 2.0. It was incredible to see the change in activity level and endurance within just one day of the surgery. It makes perfect sense when you see the before and after photos of her pulmonary valve; obviously her laid-back and mellow nature was greatly influenced by the constraints of this valve. That is still her nature for the most part, but along with a more functional valve came a sassy, goofy, and sometimes stubborn side to her personality. This whole experience has made the job of being Parker Jane’s mom all the more joyful and fulfilling. We hosted thanksgiving this year, and boy were we thankful it was a nice day, otherwise our almost 30 guests would have been crammed into our tiny little apartment. Luckily it was a gorgeous fall day and we were able to sit outside and enjoy all the wonderful food. It was truly a day to give thanks for the people in our lives, and an honor to be in the company of our incredible and loving family and friends. That being said, it will probably be a few more years until we host thanksgiving again. 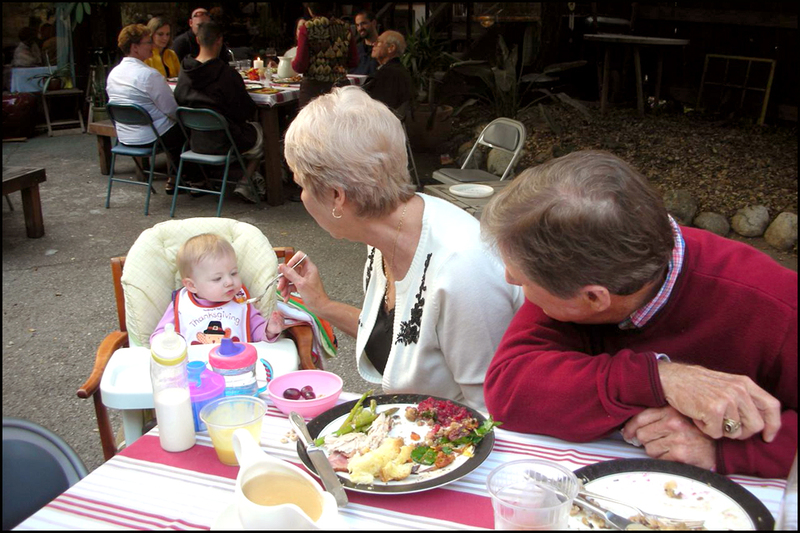 Grandma and Grandpa Wright with Parker Jane on Thanksgiving – yes, Parker Jane did eat quite a bit of everything you see on that plate. Parker Jane and I visited my parents in Escondido for a pre-Christmas weekend mid-month since they’d be traveling and we’d be in San Jose for the holidays. 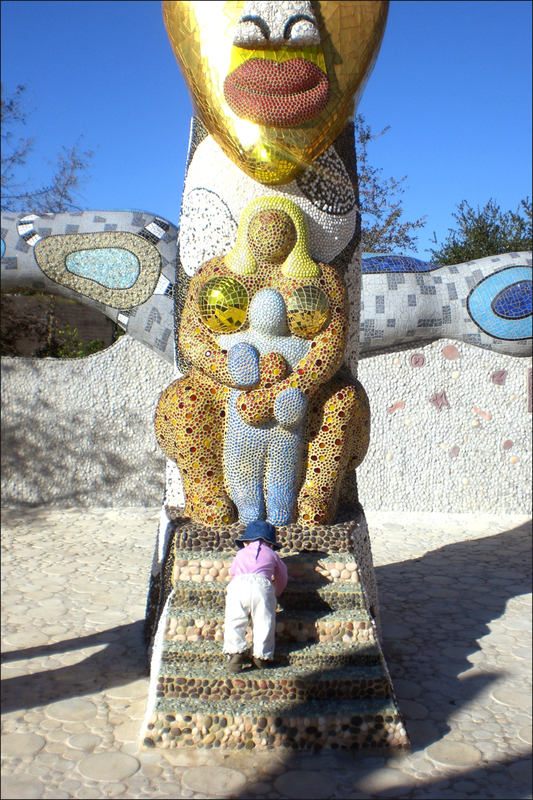 We mostly just spent time together watching Parker Jane, but one afternoon we went out to Kit Carson Park to see a sculpture garden called Queen Califia’s Magical Circle by the artist Niki de Saint Phalle. (LINK) It is all colorful mosaic glass, tile, and rocks, and very kid-friendly. Parker Jane could have spent all day there touching the sculpture and crawling around; it will be so fun to bring her back as she grows up. We improvised a Christmas morning gift opening while we were there. Her gift-opening skills did not improve much up through Christmas, as she was much more impressed with the ribbon than ripping paper or the actual gift. I hear this changes by the one year birthday? Scaling their magnificent Ruins, explorer Parker Jane Corbal seeks to find the truth behind the long lost but not forgotten tribes of Escondido. Parker Jane’s Aunt Kristen and Uncle Chris made the trip up to San Jose with us, so the 6 hour ride wasn’t as boring as it usually is for Parker Jane. We were in the bay area for five relaxing days through Christmas. We had a wonderful vacation spending good time with family and friends, and not doing much else aside from eating and playing with the baby. Parker Jane got to visit with her cousin Mya twice while we were there. Mya is 11 months older and is mostly responsible for Parker Jane’s fabulous hand-me-down wardrobe. The two combined are a cute-force to be reckoned with. 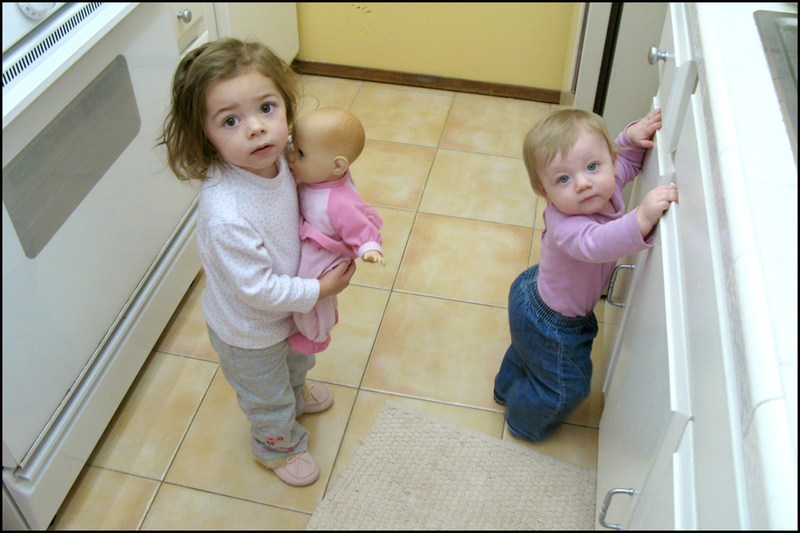 I’m so looking forward to watching these girls grow up together, and for the yet-to-be cousins too! What? We were just…the cabinet? no, we weren’t…aren’t we cute? I had predicted that Parker Jane would walk by her 10 month birthday (Christmas day), but now I’m thinking it will be closer to a year. She’s a fast and efficient cruiser now (walking while holding onto something), and every once in a while we catch her standing very briefly. She loves to hold onto our hands and walk with us; she practically runs sometimes! One of her new loves is a big purple ball her Grammy gave her. She’s taken to kicking the ball while walking with one of us. She’s gotten really good at it – so good it’s got me thinking that she’s going to be the next Mia Hamm. In fact, she half-said “ball” on Christmas for the first time. It comes out more like “baa”, but she obviously associates the word she is saying with the actual thing. “Duck” is not too far behind, and sounds like “dut”. Parker Jane delights in hearing the different sounds (and volumes) her voice, tongue, and lips can make. It appears much more so recently that when she’s babbling at us or at something, her intent is to communicate something. What that thing is though, is always up for debate! What began as a wet open mouthed slobber on the cheek has evolved into a sweet and tender kiss. There’s no telling when you’ll get a kiss from Parker Jane, but when it happens, there’s no avoiding the warm and fuzzy feeling that engulfs you. I recently told someone that Parker Jane is like a garbage can – she’ll eat anything! That’s not a really nice way to put it, but it’s kind of true. I’m constantly amazed at her openness to new foods – foods I even didn’t start eating until my 20′s! As long as it’s soft enough for her chew/gum (she’s only got two bottom teeth so far) she’ll eat it and open her mouth for more. She loves avocado best of all; she’ll eat it at every meal if offered. A true California girl. We rang in the new year very quietly, with my parents watching the ball drop on TV. Parker Jane slept as we kissed her after midnight. 2008 promises to be a very good year and we have a lot to look forward to. - For me, this month will be spent re-focusing on my business and starting to build it again (see www.seaofgreengardening.com). Rick starts an online grammar refresher course through the Pasadena City College. - In February I am going on vacation in Mexico with some girlfriends. Parker Jane will turn one on the 25th! - Shara turns one on March 1st! Rick turns 31. I have jury duty. - Our friends Derek and Mary are having a baby in April. Rick and I are going to ride in a 50 mile bike race with my dad from Rosarito to Ensenada, Mexico. - In May, bachelorette party madness will ensue in the the mountains for my sister-in-law Kristen. Rick and I celebrate 6 years of marriage. - Kristen marries Chris in June, in Santa Cruz. I’m a proud big sister matron of honor. Somehow Parker Jane will walk down the aisle as a flower girl. - The summer will most definitely be hot, and we’ll have the Olympics and the Presidential campaigning to keep us entertained. - In November, I turn 32. Two days later we have an opportunity to elect someone who hopefully will lead our country in a better direction than it’s been going in the last eight years. If all goes well, I expect an optimistic end to another good year. Written by Erin on January 16, 2008. Categories: Erin, Family, Friends, General, Parker Jane, Rick, Video. Oh, yeah… we have a blog!